This post contains affiliate links as well as sponsored content. First of all, Sibiu’s history is an interesting one. It used to be the centre of Transylvanian Saxons and the most important ethnic German city. Sibiu was a major trade centre and the first Romanian bank was based there. Nowadays, Sibiu is a significant economic hub but, most importantly for us visitors, a vibrant and super quaint city. Planning a trip to Brasov? Check out the top things to do in Brasov here! If you are wondering how many days in Sibiu are enough to enjoy the Old Town, the answer is simple. Two days are perfect so as to get to know both the Upper and the Lower Town. However, there are a lot more things to do around Sibiu. Its location makes it the perfect base to explore Transylvania’s charms such as medieval castles and amazing landscape. On top of that, Sibiu is an excellent starting point to hit the breathtaking Transfagarasan Highway. Grab your Lonely Planet guidebook and plan your Romania trip now! Piata Huet, one of the three squares around which Sibiu Upper Old Town is built. Rooftops in Sibiu Old Town have oddly shaped windows which resemble tired yet watchful eyes. This peculiar architectural element makes passers-by feel as though they are constantly being watched. Ironically enough, the Romanian people were indeed being watched during Ceausescu’s time. Therefore, Sibiu’s architecture didn’t help them feel any better. However, conspiracy theories and urban legends aside, the reason behind those small windows is simply a practical one. Back in the Middle Ages, when Sibiu was a trade superpower, those openings on the roofs served as a ventilation system to prevent goods stored in the attics from going bad. Still, it’s super fun to stare back at those never-sleeping eyes while wandering around Sibiu Old Town. Do you want to know more about Romania under Ceausescu? Click here! Strada Nicolae Balcescu is the main street in the historic centre of Sibiu. Pedestrianised, wide and lined with magnificent buildings, the street is ideal for unforgettable leisurely walks. Strada Nicolae Balcescu, named after a prominent figure in Romania’s history mostly because of his involvement in the 1848 Wallachian Revolution, is full of life all day long. Its many eateries, cafés and shops attract mostly locals, which is priceless. The heart of Sibiu beats in Piata Mare, the city’s largest square. Sibiu’s aristocratic past is omnipresent in this elegant square which is home to the Brukenthal Palace and other grand buildings. Piata Mare (Large Square) along with Piata Mica (Small Square) and Piata Huet are the three squares connected to each other by narrow passageways around which the Upper Old Town of Sibiu is built. Sit at an outdoor café in the afternoon and watch locals go about their daily lives just as the sun paints the square gold. That’s our very own best memory of Sibiu. Piata Mare is connected to Piata Mica via a narrow passageway under the Council Tower. The latter is one of Sibiu’s most iconic landmarks. Built in the 13th century, the tower has been through various reconstruction phases. Similarly, the Council Tower has had many diverse uses throughout its long history, from grain storage unit to prison and from watchtower to museum. Nowadays, you can enjoy views to the entire city of Sibiu from its top for a tiny fee. Piata Mica is a cosy and vibrant square. During summer it is filled with stalls selling souvenirs and books as well as pieces of art. The Council Tower and Piata Mica. The Bridge of Lies is perhaps the most popular of all Sibiu attractions. Romania’s oldest cast iron bridge has no shortage of legends surrounding it. The beautiful bridge is supposed to move and creak when somebody tells a lie while on it. Other gruesome stories involve throwing people off the bridge as punishment for telling lies. This mostly applied to merchants who played tricks on their customers and girls who lied about their chastity. Crossing the bridge was quite uneventful for us. It neither creaked nor moved and we certainly weren’t thrown off it. Obviously. During our week-long trip to Transylvania we had dinner at many traditional Romanian restaurants. It turns out that the one we liked best was Crama Sibiul Vechi in Sibiu. Housed in the atmospheric cellar of a 15th century building, the restaurant serves the best Romanian food we had during our trip. Traditional decor and live folk music only add to the overall unique experience. Be warned though. Portions are huge and no leftovers are allowed. You either clean up your plates on the spot or take your leftovers home with you. Reservation is advisable. The cosy interior of Crama Sibiul Vechi restaurant. Strada Cetatii runs along Sibiu’s old city walls and makes for a wonderful afternoon stroll. During this walk, it is possible to see parts of the city’s old forifications such as the Potter’s Tower, the Carpenter’s Tower and the Haller Bastion. Take a marvellous stroll along the old city walls at Strada Cetatii. Along the same route, don’t miss Sibiu Walk of Fame, the city’s tribute to the various personalities who contributed to Sibiu’s cultural development. Sibiu’s very own Walk of Fame. 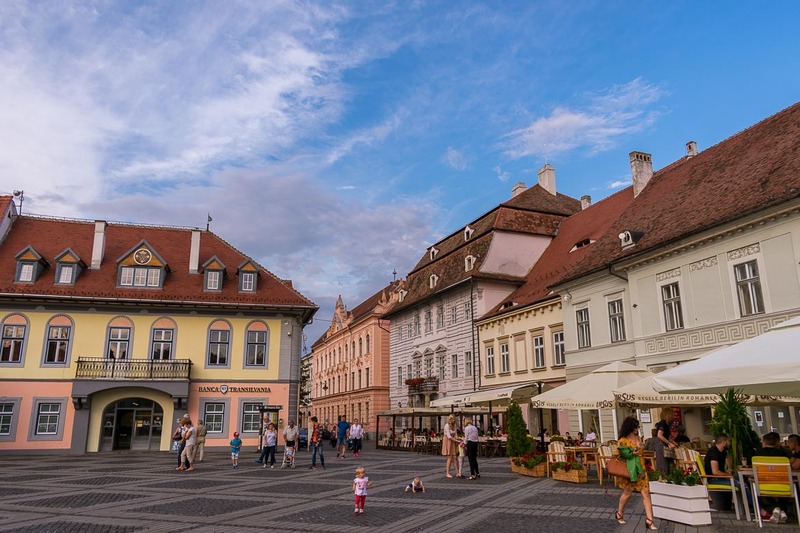 While the Upper Town abounds in aristocratic elegance, Sibiu Lower Old Town with its rustic architecture has an unpretentious yet authentic feel. Formerly the manufacturing area of Sibiu, the Lower Town is utterly charming with its colourful two-storey buildings and its wide streets. Follow the steps from the Upper to the Lower Town. You know us. We always love a good walking tour everywhere we travel. Why would Sibiu be an exception to our rule? This time we let Florin, a Romanian guide passionate about Sibiu and Transylvania in general, show us around this magnificent city. Florin is literally in love with Transylvania and this is the best quality one should look for in a guide. Letting his guests in on the region’s well-kept secrets is not just a job for Florin. It’s what gives him joy and this is what makes all the difference after all. Florin met us at Piata Huet where the Gothic St Mary’s Evangelical Church dominates. After giving us a thorough overview of the city’s history, we started strolling around Sibiu Old Town with him. We learnt a lot during our tour in a fun way as Florin made sure he embellished historical facts with amusing anecdotes. Apart from Sibiu, Florin organises tours to various places within the Transylvania region. For more information, check out his Sibiu Tour Guide website. Walking around Sibiu with Florin. Transylvania is dotted with fascinating medieval castles, which provide opportunities for excellent day trips from Sibiu. One of the most impressive ones is Corvin Castle. A visit to this specific castle is enough to let your imagination run wild to times long gone by. Corvin Castle is a 90-minute drive from Sibiu so it can easily be done as a day trip. 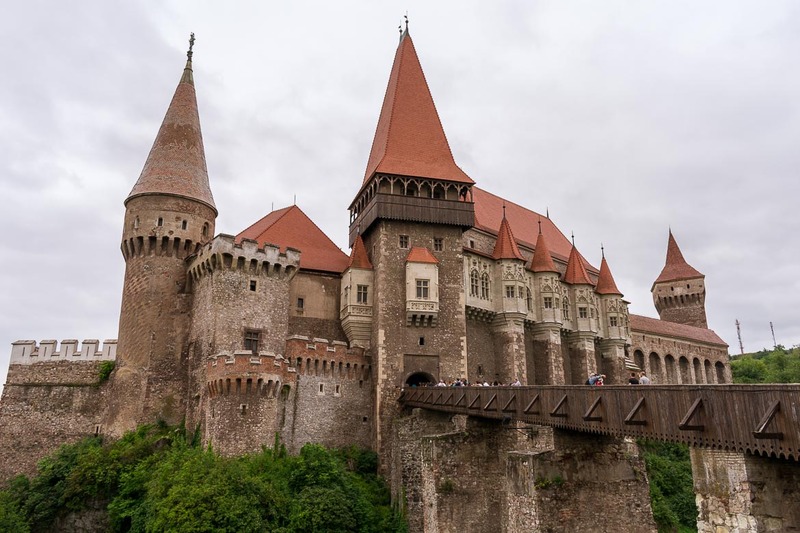 Read more about Corvin Castle and other Transylvania castles here! Crossing the Transfagarasan Highway is one of the main reasons why anyone should consider a trip to Transylvania in the first place. The second highest paved road in Romania is no longer one of the country’s hidden gems as driving enthusiasts from all over the world plan trips to Romania so as to experience the thrill of driving on the best road in the world, according to Top Gear. The Transfagarasan offers a unique driving experience alongside breathtakingly beautiful scenery. Staying in Sibiu before hitting the Transfagaran Highway can prove a very wise decision. Sibiu is located relatively near the road’s northern end. This way you can hit the Transfagarasan early in the morning when it is less crowded, hence way more enjoyable. The Transfagarasan Highway in the fog. Sibiu International Airport connects the city to many destinations in Germany as well as a handful of other European cities. Alternatively, if you can’t fly directly to Sibiu Airport, you can land at Bucharest, rent a car at the airport and drive to Sibiu as part of a road trip across Transylvania. That’s how we did it anyway. You can also travel from Bucharest to Sibiu by train but keep in mind that journey time is about 6 hours. If you’re driving and staying in Sibiu Old Town (which you should), make sure you park the car at the designated areas for a very small daily fee. The most convenient parking spaces are located in Piata Unirii or right in front of the Continental Forum Sibiu Hotel. Expand your trip by getting to know Romania’s vibrant capital, Bucharest! Watchful eyes on Sibiu rooftops staring down at the Bridge of Lies. It will come as no surprise for you to hear that the best place to stay in Sibiu is the Old Town. We know we may sound boring saying the same thing almost every time. But where we choose to stay, both in terms of location and, sometimes, in terms of the accommodation itself, is really important to us. That’s why we want to help you make the right choice too. Staying in Sibiu Old Town means that you get to see every single point of interest on foot at a leisurely pace. For our Sibiu accommodation, we chose Baroc Apartments Sibiu which enjoy a prime location, literally a stone’s throw from Strada Nicolae Balcescu. For a little less than 90€, we spent two nights in a spotlessly clean room with minimal decor. However, what’s more important, our host went out of his way to make our stay comfortable and tend to all our needs. Book your room in Sibiu Old Town now! As mentioned above, for traditional Romanian cuisine head to Crama Sibiul Vechi. However, if you’re spending a few days in Romania and need a change, like we did, Benjamin Steakhouse and Bar is a great alternative. In its cosy interior we surrendered to the comfort of a burger for Katerina and vegetarian pasta for me. We washed everything down with a couple of palinca shots. Don’t miss the latter. It’s a strongish Romanian spirit made of various fruit. Go for the apricot one. However, the real treats in Sibiu are gogosi and covrigi. Gogosi are enormous doughnut-like pieces of fried goodness with various fillings, both sweet and savoury. On the other hand, covrigi are similar to bagels. They are both popular and ridiculously cheap snacks and Strada Nicolae Balcescu is lined with small shops selling them all day long. Summer or early autumn is the best time to plan a trip to Sibiu. Not only because you’ll get to spend more time outdoors in gloriously fine weather, no. The most important reason is that, if you’re planning to drive on the Transfagarasan Highway, the latter is only open from late June (or early July) to October. Piata Mare on a glorious summer afternoon. The official currency is the Romanian Leu (RON). As far as spoken languages are concerned, we had zero luck with English. If you don’t speak Romanian, perhaps German is your next best shot although we can’t vouch for this as we don’t speak German ourselves. That said, body language and basic Google Translate usage got us a long way while in Sibiu. So we hope we convinced you to take your own Transylvania trip farther than Brasov and plan a trip to Sibiu in Romania. If you need more assistance planning your Romania trip, please do reach out to us and we’ll be more than happy to help. La revedere! If you liked this article, we’re sure you’ll love our Sighisoara Guide as well! Like our article? Pin this image! Disclosure: Florin gave us a complimentary 1-hour tour of Sibiu Old Town. Yet, as always, we share nothing but our honest opinions about the experience we had.